"The fine, white stretches of sandy beach are a sun worshipper's dream ideal for a relaxing, away from it all holiday". The Costa de la Luz is Spain's most southwesterly coast, stretching from the Straits of Gibraltar to the Portuguese border, lying in the colourful and charismatic province of Andalucia. Named after the bright sunshine that bathes the shore, the 'Coast of Light' leaves the hustle and bustle of the other Spanish Costas behind and the true, natural beauty of Spain shines through. You will find some of the most incredible beaches in Spain stretching along the Costa de la Luz shoreline. Framed by undulating sand dunes and fragrant pine trees, the silky, white powder makes a perfect sunbed from which to soak up the glittering rays. The breeze rolling in off the Atlantic creates superb conditions for a variety of watersports, attracting windsurfing fanatics from all over the world. If it's modern department stores and fashionable boutiques you're after, look no further than the elegant cities of Cadiz and Seville, where you can purchase the latest designer goods. Elsewhere you will find the Moorish craft traditions very much alive in the delicate filigree jewellery, decorative pottery, basketry and handbeaten copperware. Packed bars and heaving dance floors are something you’ll struggle to find, as evening activity typically consists of a long stroll along the coast as the sun sets followed by a leisurely, al fresco meal and then perhaps a glass of chilled wine with the locals in a rustic bar. This stretch of coast has seen relatively little development, with tourism consisting of a few small resorts lazily evolving around former fishing villages and the most glorious stretches of sand. From the resorts, you can easily explore the Andalucian mountain ranges with their breathtaking scenery and timeless hilltop villages, and discover the hidden charms of rustic Spain. 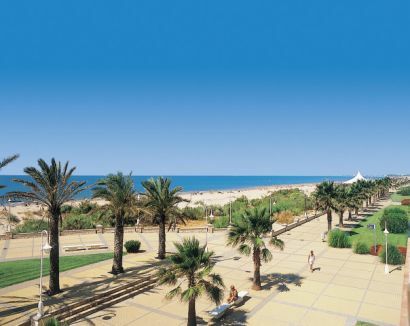 Costa de la Luz offers something for everyone, whether you're looking for a healthy tan, a game of tennis, a round of golf on some of the best courses in Europe or just the opportunity to revel in the lively atmosphere and abundant sunshine. The Costa de la Luz is home to some delicious specialities, including the authentic version of 'gazpacho' a chilled puree of tomato, cucumber, peppers, onion and garlic. The region is also famed for its sherry. The word for this delectably rich fortified wine is actually derived from the Moorish name of the city it originates from Jerez. You won't have to go far to find tasty tapas and you should also look out for fresh seafood, especially tuna, prawns, lobsters and clams. Ham from the province of Huelva is renowned for its superb quality, texture and taste harvested from wild pigs raised on forest acorns. Most hotels or apartments ask customers to vacate their rooms between 10am and 12 midday. For late afternoon or evening flights, late check out rooms may be available. Please see Your Holiday Your Choice on accommodation pages.